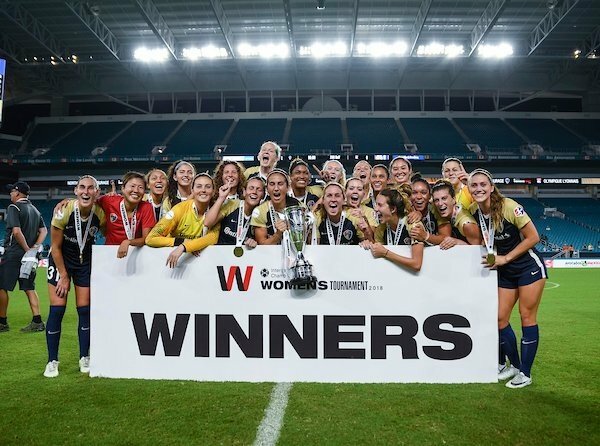 On July 29, the NWSL’s North Carolina Courage won the inaugural Women’s International Champions Cup with a 1-0 win over French club Lyon, the three-time defending UEFA Champions League champion and best funded women’s club in the world. We spoke with Anson Dorrance about the appeal and importance of a women’s club world championship, which the ICC has taken a first step toward -- as well as the upcoming U-20 Women’s World Cup, the evolution of the women’s game around the world, and the keys to the USA’s remaining a world power. Dorrance coached the USA to its first Women's World Cup title in 1991 and has led the University of North Carolina Tar Heels to 22 national championships. More than 60 of his Tar Heel players have played for the U.S. national team. SOCCER AMERICA: What did you think about the inaugural Women’s ICC? ANSON DORRANCE: Well, I absolutely loved it, in all respects except the crowd. You and I both know that Lyon is on a different level. And we also all know that the Courage was missing six starters [on national team duty]. It was a wonderful result for the Courage. Obviously, from a national team perspective, the United States has huge respect, but from a club perspective, I think the impression all of us have is that places like Lyon are completely separate from even the top teams of the NWSL. I mean, the Courage did have advantages, being in midseason form while Lyon is in its preseason. But in every respect, the result is wonderful for the NWSL, just wonderful for women's international and club soccer. SA: You’ve got a close connection to the Courage, right? ANSON DORRANCE: [North Carolina Courage head coach] Paul Riley and I are good friends and we were texting back and forth following the game. Of course, Bill Palladino, my [UNC] volunteer assistant coach, is one of Paul’s assistants, and Sean Nahas is the brother of Damon Nahas, one of my assistants, so our connection with the Courage is very, very close. Paul doesn't have any delusions of grandeur. Neither does Palladino -- they knew they were hanging on for dear life [after taking the lead in the 10th minute]. But having said all that, I was very proud of the fact that the junkyard dogs of the Courage never gave up and made it hard for Lyon. And I got a wonderful text from Lucy Bronze, who's the right back for Lyon, who played for me [at UNC]. She was very complimentary of how hard the Courage kids worked. ... Against a team that pays one player as much as the entire Courage payroll. SA: What impressed you about Lyon? ANSON DORRANCE: For any of us sitting there watching, a different level – their speed of play, their combination play. I really enjoyed that every kid, when they received the ball with their back to a Carolina Courage player, they were so comfortable. It was almost like if someone's on my back I'm not marked. I have the ball. They can't take it from me. And they demonstrated that again and again and again and again. But I think an athlete like Lynn Williams may have shocked Lyon, because I don't care what your soccer level is if you're in a foot race with Lynn Williams, I don’t care who you are on the Lyon roster, you’re going to lose that foot race. And the other thing I love about Heather O’Reilly [a UNC alum], when she got back from Arsenal, I was telling her how great her transition game was. And we saw that when she scored the winning goal. SA: There were only a few hundred fans for the semifinals and a couple thousand for the ICC final Hard Rock Stadium in Miami, but at least they got the ball rolling on having a World Club Cup like the men have? ANSON DORRANCE: I was thinking maybe the group that should have hosted that game was the Courage in North Carolina. You would have had close to sellouts for those games because obviously we've got a very soccer-educated community here and I really feel like the Courage fans would have showed up. I think all of us out of curiosity wouldn't just turn it on the television. We would have been there at the game. But I think this is a wonderful additional piece in the women's game. And I hope they continue to do it. On the day of the final, I watched the USA-Australia [Tournament of Nations] game before clicking on the ICC final. Lyon was actually a better side than all the national teams. And so I think this is a really positive thing for women's soccer. Players on a club have more time together, the players know each other better, have more extended trading periods, etc, etc, etc. I'm watching this going, oh my gosh this is different level. I’ve got it Tivo-ed, and when preseason starts, we're gonna have the girls over one evening to watch the first half and another to watch the second half because, I want them to see the game at the highest level. SA: The U-20 Women’s World Cup kicks off this weekend. How do you feel about the USA? ANSON DORRANCE: Well, I think it's been a good cycle for the U.S. I mean I think Coach Jitka Klimkova has done a nice job with the U.S. team. And the thing I really appreciated about this year from Jitka, U-17 coach Mark Carr, and B.J. Snow with U-23s -- is the amount of information they're sharing with all of us whose players they're borrowing. I think in the old days there was a sort of disconnect between the clubs and the colleges and the U.S. national teams that were borrowing the players. And I think that's completely changed. I genuinely appreciate that. SA: Is every World Cup the U.S. women go into more difficult than the previous one? ANSON DORRANCE: Yes, I think it is going to be increasingly tougher. Part of convincing me of that was watching Lyon -- and watching Holland win the Euros [coached by former UNC player Sarina Wiegman] and to see their standard -- and then to hear about their youth standard in some of these events that I didn't attend. I think all the countries are all taking women’s soccer a lot more seriously. And I think this is incredibly positive our game. I don’t look at this as a negative at all. It means there are going to be more and more challenges for us. That's appropriate because that's telling us the women's game is growing. SA: What does the USA have to do at the U-20 World Cup for it to be considered a success? ANSON DORRANCE: I think at a minimum, tragically, because of our traditions, if you don’t reach the semifinals, even at the youth level, I think it’s an issue. You could have a group that’s so distorted, surviving the group might be a great achievement. But I think, unfortunately, for the United States given our history, the semifinals is a minimum. SA: Do you see a future in which U.S. women’s soccer will always be among the top powers? ANSON DORRANCE: Yes, but I think it’s becoming harder and harder. The rest of the world is investing in its women. Their soccer cultures are much better predisposed to developing players because of their long-term practices and successes on the men's side. So, I think the challenge from the women's side is that it will get harder and harder. I don't expect it to get easier, which is why these people who are working for U.S. Soccer are trying to figure out a way for us to stay on top. It's an unenviable job because these other countries are going to take pieces out of us. And then, of course, the trolls are going to assume that the sky is falling and they're going to be very critical of our coaches, which, in my opinion, makes it even harder for us to agree on a direction. It's so simple to sit and criticize when they don't understand the huge challenge it is to stay on top. It's an incredibly difficult challenge. ANSON DORRANCE: Lest anyone forget, back when we won the [the inaugural Women’s World Cup in 1991], our rivals were the Scandinavian countries Sweden and Norway. All of a sudden in 1999, in our second World Cup victory, we played China in the final. And now we've played most recently in 2015 where our final opponent was Japan. Where is China? Or Norway? I'm incredibly proud of all the things we've done and even though I don't think it's perfect, I do love what's happening in this country and the contribution of all these wonderful coaches to put us in position where we're still competing for world championships. It’s an athletic dynasty. I think it’s credit to us despite the fact that I am critical of areas. I'm still wonderfully respectful and appreciative for people like Sunil Gulati and the people who are part of this organization for years, but also the previous presidents and our national coaches that put us in the position to be still very competitive on the world level. I'm proud to be a part of that conversation and I fully support these people even though I can certainly nitpick over this or that. In general, I couldn't be prouder of the legacy of American women's soccer. SA: The USA’s quarterfinal exit at the 2016 Olympics was its worst finish at a world championship. How indicative was that of the USA’s standing women's world soccer? ANSON DORRANCE: You also have to understand the nature of the game, the incredibly difficult aspect of a one-game series like us being knocked out by Sweden in the 2016 Olympics. It's so easy for people to criticize the failure of a coach in a one-game series. But that’s the nature of the game. You can put 11 people in your box. But have you really achieved anything of playing it that way? Yes, you've achieved the result, but that's about it. And honestly, if you think about it, Italy and the Netherlands not making the [men’s] World Cup means there are much greater issues at stake for them. Those cultures have every reason to feel like they've arrived and remain a success. Absolutely. So, from that perspective I'm wonderfully respectful. There are issues I have where I do feel we should make some changes, but in general many of our decisions are very good. I’m very happy with where we are, which is the reigning world champions. SA: We often talk about about the USA getting a head-start in women’s soccer. How much impact did Title IX have in giving U.S. women's soccer a leg-up compared to other countries? ANSON DORRANCE: Title IX unquestionably was integral, and it also stimulated what was already starting to germinate in our own culture. It wasn't entirely Title IX, because our culture was set up to succeed in the woman's game as well. What's interesting is that back when I started coaching even someone who knew absolutely nothing about women's soccer would do a pretty good job of ranking the teams of the world in the women's game based on the freedom of the women in the cultures of those countries. The further north you go in Europe the more women are actively involved in all leadership positions including running countries. The further south you go in Europe, and in Africa and Asia where there was originally a very limited women's leadership role, they weren't as competitive. So I think Title IX was a major factor but it wasn't the only one. It was planted in a flower bed of this cultural freedom of women in the U.S. It was a combination of factors. Everyone would like to make it so simple by pointing to one thing or another but I don't think you can. You can point to the value of Title IX, but you can also point to the fact that the women in our country have had a wonderful freedom like few women in the world. The best comparison are the Scandinavian countries and the teams in northern Europe. SA: What about how soccer was marketed in the 1970s in the U.S. as a family sport that everyone could play? ANSON DORRANCE: There's no question. When you loaded up the minivan back in those days, it wasn't just the boy that was dressed in his soccer gear, it was also the girl. The parents would drive both to the soccer park and drop their girl at one game and their boy at another and the parents would choose which kid they would support. That's not a Title IX issue for the parents, that's a "I've got a boy and I've got a girl, and they both love soccer, so let's support them both." It wasn't this chauvinistic, "Oh, no, no, no, let's just support the boy and let the girl play in the sandbox next to the field." That again points to the real liberation of the American woman. Title IX was a factor but not the factor. Culture was the factor, which obviously Title IX was built on. SA: Do latecomer nations to women's soccer have an advantage because of their well-established, wealthy men's leagues? ANSON DORRANCE: If you're a part of a top club in England, and your men's team has huge respect, and all of a sudden you're on the board of directors of the club and you have a little daughter who is starting to play. What do you do as an executive? You start a women's team. Since you're socially evolved, you're going to spend money on that team. What really impressed me the last time I was in England is when I went to visit Arsenal, Chelsea, and Man City, the investment that Man City had made for the women's team was off the charts. Lucy Bronze, possibly the best right back in the world, invited me in and I saw the way they treated their women and it's just stunning. Now, from what I understand, Manchester United is aboard. With the investment they make you'll see that club jump ahead and accelerate. The same thing is happening with the Spanish clubs, so you'll see Spain take off like a rocket. Germany's been dominating Europe forever and beat everyone to the punch in terms of the commitment of some of their clubs to the women's game like few countries in the World. ANSON DORRANCE: Very few players who end up playing for the national team are ever subbed out of the game. So what do you want them to do, play against an opponent who's eventually going to wear out? Or do you want that player to play against a player who gets exhausted after 30 minutes, and gets replaced with a fresh one, and now he's got to deal with a fresh player, while the other one's recovering to come back in. So you can make a case on the substitution divide. I'd like to argue that what's better for players who haven't developed as rapidly, substitution is better for the smaller player because at least they get to play a bit. Because then you can substitute them in and out so they can survive it. I would argue very aggressively about keeping substitution. SA: When Americans debate the substitution rules at the youth level, we usually don’t consider what is happening in other countries. What do you know about that? ANSON DORRANCE: I spent a week with Benfica, and visited a U-19 team that did very well in Europe. They were experimenting with substitution and they really felt like it was a much better way to help these players get to their potential. Their substitution patterns were similar to mine: when a kid stopped sprinting you take them out of the game. And then there's sort of a double-edged sword with this. First of all, the kid wants to play 90 minutes. So, he’s got to train. And if he doesn't, he doesn’t play. There's a motivational component to that and the other advantage for that is in your league when players are in self-doubt, it can speed up the tempo of the game. You get a Liverpool press for 90 minutes even though you don't have a Liverpool standard player. So, they learn to navigate that pressure better. There are a lot of different ways to look at this conundrum that everyone seems to have about following the FIFA rules, which in my opinion, is not is as airtight of a proven player development jar as some people would like you to believe. SA: What do think is most important to the USA's approach going forward? ANSON DORRANCE: I've always believed that one of the coolest things about the United States is we're such a massive country. Maybe the way we develop our players is the way someone advises you on the assembly of your stock portfolio. You don't pull all of your eggs in one basket and invest in bonds or just in foreign stocks or something, but you put a little bit into this and you put a little bit into that. So why not give the reins to coaches across the country to have the freedom to experiment with what they feel the best thing for player development is, within their hamlets, or regions, or states, or leagues, and start to develop a sort of a national identity and personality. Let's embrace all the different ideas. Let's embrace our wonderful diversity and certainly try to correct it with discourse and with leadership. But let's not put some have sort of a one dimensional look at what's going on. And use that as a formula to protect ourselves against our own failure. Let's allow all these different ideas to flourish and let's keep coming back to the table with our best practices. We can certainly agree on things to some extent but allow a certain amount of freedom so we can all develop this game the way it's developed all over the rest of the world, with different philosophies, different ideas, different lengths of confrontation, different systems, different shapes, different players, and different positions. I think we've got the population to do that in the right way. 6 comments about "Anson Dorrance on the NWSL's big win, the upcoming U-20 World Cup, and the evolution of women's soccer around the world". Christopher Osmond, August 3, 2018 at 9:57 a.m.
Of course Anson likes unlimited substitution rules because he has the depth due to his recruiting that allows him to impact the game w/high pressure play all game long. But if you take this away, and have him play FIFA rules, his teams will have less of an understanding of how to play the game from a strategic and even tactical level--in part because their charging around the field. Unlimited substitutions are good for scrimmages, inter-squad practice games, etc., but here you’re looking to see if players are learning from the goals set up in the general practice sessions. At the end of the day, it is a 90 minute game where also understanding game speed and pacing is just as important: The tactical awareness on when to speed up and slow down needs to be developed as well. Otherwise, your turning soccer into an indoor soccer or hockey game. The only thing you will see then is frenetic soccer, which watching many women's college games, is exactly what you get: You see industriousness but limited skillful combination soccer. I total disagree with his argument about player development. frank schoon replied, August 3, 2018 at 11:42 a.m.
Christopher, I so agree on the substitution thing and the advantage it gives Anson's team. Bob Ashpole, August 4, 2018 at 4:35 p.m. Sorry Frank and Chris, I disagree with the idea that Anson's success is owed to platooning players. My primary basis for objection is that I played with few substitutes against college team's platooning 22 players in shifts. Their whole game plan centered around lots of north-south sprinting. It was like playing a glorified high school all star team. We were 120 minute match fit. The opponents were 22 minute fit. We ran opponents into the ground by making them chase the play. They ran out of legs after the first 10 minutes of a half. Typically they placed the fastest players all in the first shift, which meant their second shift never could match the pace of the game even when fresh. The platoon system is no substitute for good soccer. If you ask Anson, he will tell you that the platoon system is great for player tactical and technical development. That full match fitness can be developed later. If he isn't smart enough to coach the international game, how do you explain the 1991 success with a new program? frank schoon replied, August 4, 2018 at 4:55 p.m.
R2 Dad, August 5, 2018 at 1:19 a.m.
"Let's embrace our wonderful diversity and certainly try to correct it with discourse and with leadership." That's all we've had the past 50 years, and this wonderful diversity has led to random levels of skills, awareness, technique and development. The real problem, of course, is correcting with discourse and leadership is nonsense. That's a process that doesn't work--can't work. At the end of the day, that means all of these thousands of highly-paid coaches flying to an expensive conference, being told what to do (or ignoring such dictates, more often than not), picking and chosing what they want to implement like they're in a cafeteria line. It doesn't work. It's never worked. This is BS. And US parents have been conned into paying for all of it. Bob Ashpole replied, August 6, 2018 at 4:01 p.m.